THERE are indications that the Federal Government may not meet set targets in the power sector as a result of the underperformance of many operators. 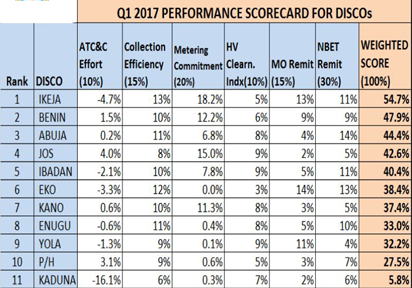 The Nigerian Electricity Regulatory Commission (NERC) that has been monitoring the Electricity Generation Companies (Gencos), Transmission Company of Nigeria (TCN) and Electricity Distribution Companies (Discos), indicated in its report that many of them performed below expectation in six months (between Q4’16 and Q1’17). According to the report obtained by Vanguard Sweetcrude, NERC which used factors such as availability and average load to rate the Gencos identified three power plants – Sapele, Geregu NIPP and Afam (1-V) – as the least performers with 31 per cent, 18 per cent and 12 per cent scores respectively. The top performers in this category were Omotosho, Olurunsogo and Calabar NIPP with 89 per cent, 88 per cent and 87 per cent respectively. These were followed by Okpai, Ughelli, and Omotosho NIPP with 87 per cent, 80 per cent and 78 per cent respectively. Geregu, Afam V1, Ibom Power, Rivers IPP, Alaoji NIPP followed with 78 per cent, 69 per cent, 67 per cent, 64 per cent and 63 per cent respectively. Other plants – Ihovbor NIPP, Omoku, Trans-Amadi, Egbin, Olorunsogo NIPP and Sapele NIPP – scored 61 per cent, 58 per cent, 48 per cent, 46 per cent, 45 per cent and 38 per cent respectively. 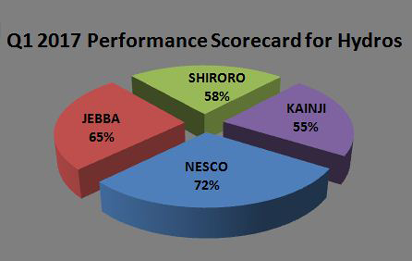 The hydro stations – NESCO, Jebba, Shiroro and Kainji – were scored 72 per cent, 65 per cent, 58 per cent and 55 per cent respectively. TCN that has the responsibility to transmit and deliver power for distribution experienced over 15 system collapses (total and partial) in six months. According to the report, Nigeria experienced five total collapses in the fourth quarter of 2016 and eight total collapses in first quarter 2017. Also, it experienced two partial collapses in Q1-2017 and zero in the fourth quarter of 2016. The report disclosed that Kaduna, Port Harcourt, and Yola Discos were the least performing electricity distribution companies with 5.8 per cent, 27.5 per cent and 32.2 per cent respectively. However, it identified Ikeja, Benin and Abuja Discos as the highest performers with 54.7 per cent, 47.9 per cent and 44.4 per cent respectively. These were followed by Jos, Ibadan, Eko, Kano and Enugu with 42.6 per cent, 40.4 per cent, 38.4 per cent, 37.4 per cent and 33.0 per cent respectively. The Discos were scored based on their ATC &C effort (10 points), collection efficiency (15 points), metering commitment (20 points), HV clearn Index (10 points), MO remittance (15 points) and NBET remittance (30 points) respectively. Specifically, many companies did not do well in most key performance indicators, thus impacting negatively on the sector and Nigeria’s economy. The inefficiency associated with revenue collection has affected the operations of not only the Discos but also the Gencos. Consequently, the Gencos and other operators in the power chain may have to struggle to run its operations as compliance to remittance from the Discos averaged less than 15 percent out of the 30 percentage points target. The highest remittance was Abuja Disco with 14 percent, followed by Eko Disco with 13 percent; while Ikeja, Ibadan scored 11 per cent each, Enugu scored 10 percent. While Yola scored 4 percent; Kano and Jos scored 5 percent each. Also, Kaduna, Port Harcourt and Benin scored 6 percent; 7 percent and 9 percent respectively. Consequently, the report charged the Discos to speed up their customer enumeration exercises. It stated: “Discos should adhere to commitment made to the commission on metering, network upgrade and expansion, enforcement of customer service standards to include respect forum office directives, 30 days timeline for new point load connections to promote ease of doing business, completer metering of MD customers, improvement in timelines for fault clearance and communication of planned outages. The report also called on TCN to improve it capacity and quality of service (supervisory control and data acquisition, SCADA, and investment in network expansion/capacity). The post Gencos, TCN, Discos underperformance threaten FG target – Report appeared first on Vanguard News.